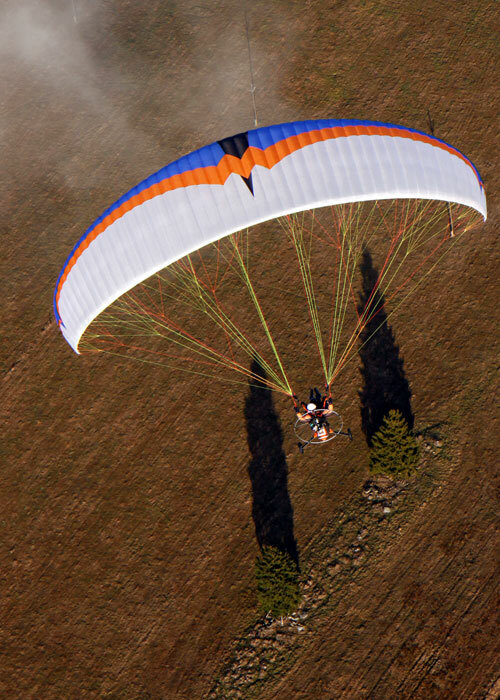 The new Pasha 4 Trike is a superb tandem wing for use with a foot launch paramotor or a tandem trike/quad. The very easy take-off and great landing behavior of the glider is well suited for both commercial and recreational use. Its excellent performance combined with light and precise handling will delight paramotor pilots that want to travel with a passenger. The Pasha 4 Trike is an elliptical canopy with 54 cells and flat aspect ratio of 5.4. 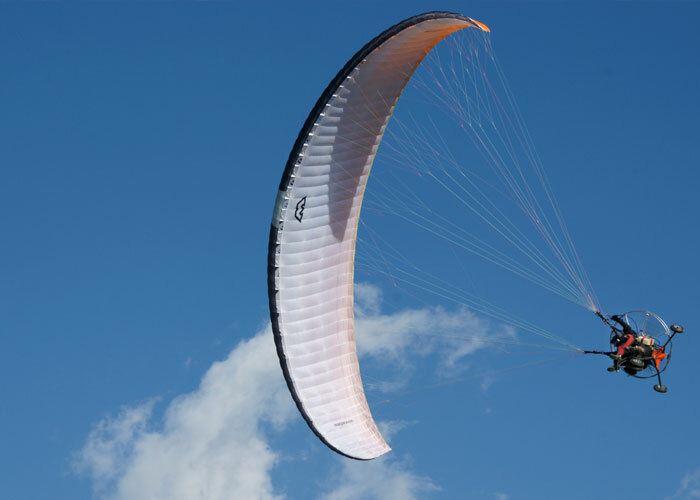 The latest “Paragliding” software helped to aid design by giving a cleaner sail. This resulted in less drag over the airfoil and giving improved glide performance. The classic construction with diagonal V-tapes and a system of de-powering lines and tapes gives the canopy stability and helps maintain a clean profile. Lines are attached to every second rib and this construction allows the lines to be reduced to two tiers except at the wing tip. To improve the sink rate whilst in big ears a wide area of the surface is attached to the outermost lines and those lines are reduced to three tiers. A very simple line layout employing 3 A, B and C and 2 D main lines allows easy preparation prior to take off. The main lines of Pasha 4 Trike have higher strenghts and different main line diameters compared to free flying version. The Pasha 4 Trike has a 5 point riser including a longer trimmer system with claw buckles on D straps and additional claw buckles on A straps. It offers higher cruising speed and good fuel consumption. The risers are split to facilitate Big Ears. The positioning of the outermost A line makes progressive closure easy. Special attention to the small details are clearly seen on the Pasha 4 Trike. It is equipped brake handles with a swivel and extra strong neodyme magnets as a standard option. Velcro closures on the wingtips make access easier to remove any sand, grass or small stones from the glider. Like all of our Pashas the Pasha 4 Trike inflates very easily in all conditions even in a light, nil or cross wind. The MacPara legendary easy inflation is very important for the Pasha 4 Trike since you want to get up and away instead of wasting time on the ground with your passenger. 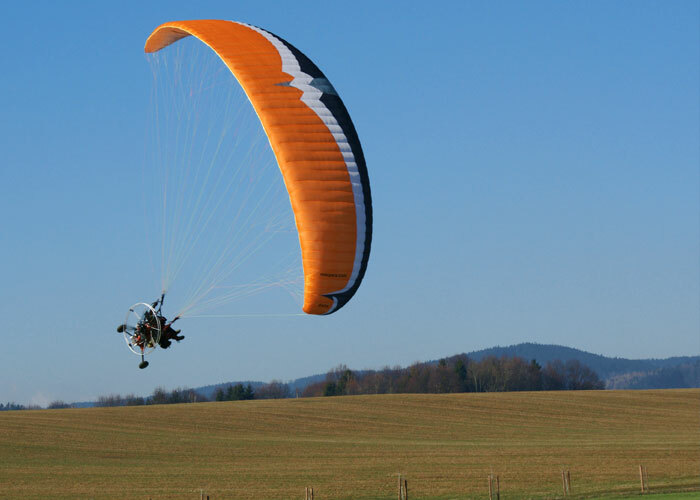 It has pleasant ground handling characteristics that is suitable for tandem paramotoring. Applying full power and adding lightly applied brakes, you will be in the third dimension of flight. The Pasha 4 Trike is very stable in flight with good speed even when lightly loaded. The handling is precise in turns and it’s really comfortable to enjoy flying under the Pasha 4 Trike for long flights thanks to the special trailing edge bunching brake system. This brake system pulls together the trailing edge when applying the brakes. Just a short brake input is needed for a flat turn. The longer range of trim system on the risers offers you more safety and control of speed when you have a lighter passenger or when the wind is strong. Maximum speed can be achieved with trimmers on D straps fully released and trimmers on A straps fully closed. The maximum speed measured with a high wing loading is 48-52 km/h. Of course, this depends on wing loading. Spiral dive is easy to enter if you ever need to do it. 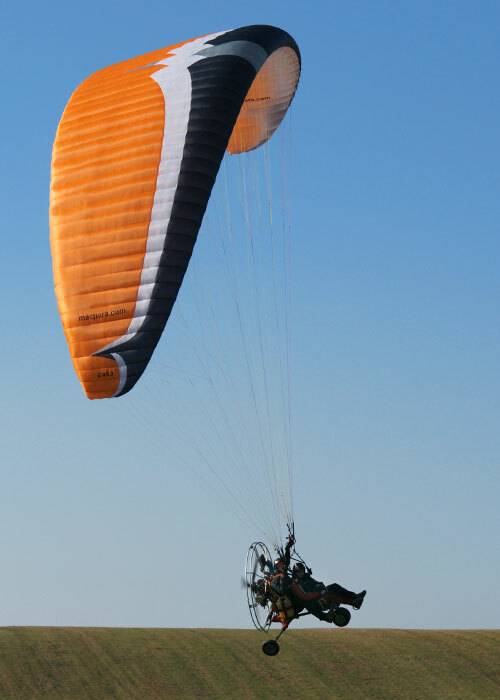 The Pasha 4 Trike is not spiral stable, meaning that the glider exits the spiral when the pilot releases the brakes and returns his weight-shift to a neutral position. The exit is quite simple and the pitch remains well damped. The landing is very easy and similar like on Pasha 3. The flare is nice with good control of speed. With good piloting you do not need to take a step forward when landing. 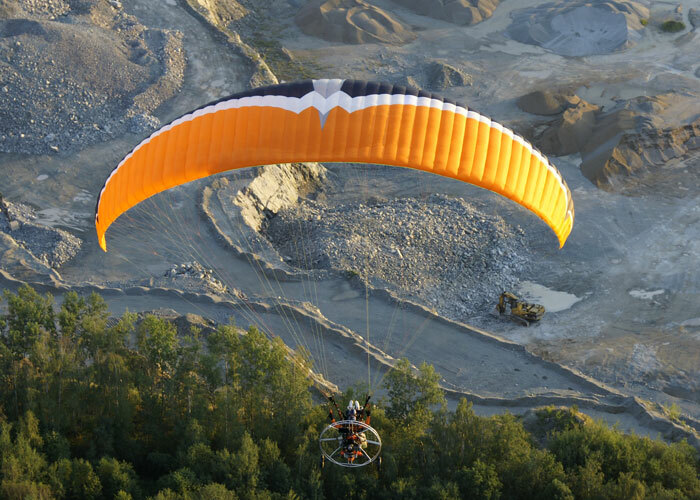 In addition Pasha 4 Trike is certified for paramotoring for loading of 200-300 kg. All Macpara products use high-quality materials and are subject to constant quality controls during the manufacturing process. It is because of the ongoing consistent development that makes MacPara continue to produces high quality products. You will be proud flying MacPara products including the new Pasha 4 Trike! 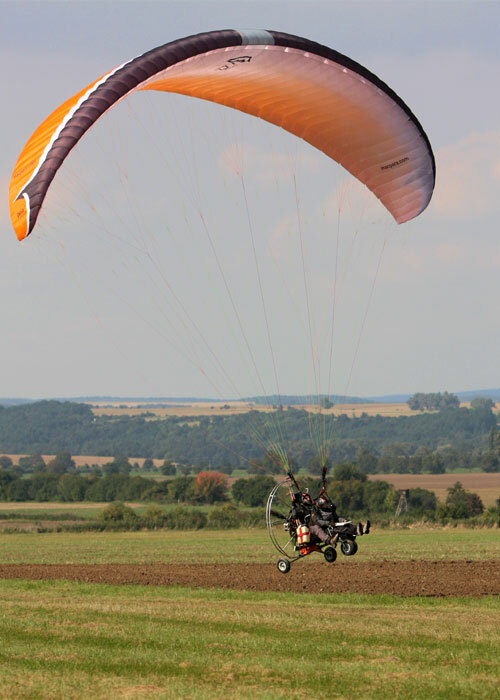 The Pasha 4 Trike is manufactured using the paragliding industries well established lightweight material with excellent durability; Skytex 40, from Porcher Sport (NCV). Because for any glider, the part that always wears out first is the leading edge, we use Skytex 45 with evolution coating E85A for this. For the less stressed areas of the sail we use Skytex 40 with E38A coating. For the supporting and diagonal ribs we use Skytex 40 with “hard finish” coating E29A. This gives the advantage of a sail that is both lightweight and very durable. Lines on Pasha 4 are made from the well-established Edelrid lines series A-6843 of differing diameters.